Knives has imprisoned Vash, and now he's going around gathering plants. By plants, I don't mean green things growing out of the ground, but instead those angelic, humanoid, powerful plant-beings that make it possible for humans to live on the planet Gunsmoke. Vash and Knives are themselves a form of plant, and have the same power, but what will Knives do with this huge power supply? Meanwhile, things are looking pretty tough for Wolfwood. 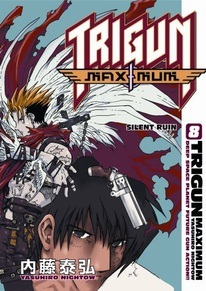 And speaking of Nick, this volume contains a special spin-off chapter based on our favorite preacher-slash-gunslinger. Learn a little more about the man in the suit with the confessional helmet!